If you ever attended Colegio Americano in Rosario, Argentina, you may be interested to know that there is an alumni association (of sorts). We even held a big reunion in Houston in 1994! Please contact Miles Abernathy, miles99 -AT- gmail.com, for more information. 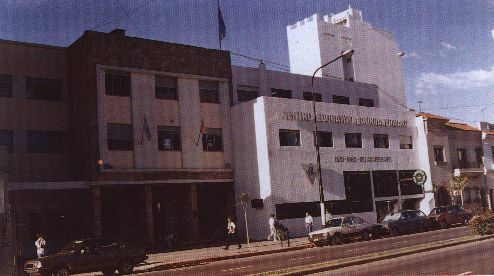 Note that Colegio Americano has been renamed Centro Educativo Latinoamericano, and its related institution of higher education is Universidad del Centro Educativo Latinoamericano, or U.C.E.L. The Centro is located at Avenida Pellegrini 1352, 2000 Rosario, Argentina. Telephone 261241, fax 499292. Their web site (in English and Spanish) is at http://www.cel.esc.edu.ar/index.htm (school, email cel@citynet.net.ar ) and at http://www.ucel.edu.ar (university, email sec@ucel.edu.ar ). This photo appeared in the September 1996 issue of La Triada del C.E.L., the magazine format publication of Centro Educativo Latinoamericano. At that time C.E.L. was celebrating its 121st year of service. Roland Heddins (rjheddins -at- aol -dot- com) visited Rosario in December, 2004, and brought back a wonderful collection of photos that you can see here. To enlarge a picture, just click on it. If you hover your mouse over a photo you will see the name. Roland also provided this photo of students at Colegio Americano, taken in about 1970. There are some nice videos about Rosario on YouTube. The city has definitely changed! August 2011, Inés Vitale sent a nice PowerPoint slide show of the "New Rosario." You can download it by right-clicking here. You are likely to recognize some of the sights from when you lived there "way back when," but the others will show you how the city has grown and changed. June 2011, Miles was able to return to Rosario with his daughter, to show her where dad lived and went to school. We enjoyed the Grand Tour provided by Inés Vitale and her friend Lili. Susie McCoy Tollett sent scans of five 1960s photos of Colegio Americano. You can see them here. Centro Educativo Latinoamericano (formerly Colegio Americano) has a Facebook fan page. From Roland Heddins via Facebook comes word that Miss Judy (Judy Trumper) has passed on. The date of death was 7/2/09, which is probably Feb. 7th. She would have been 78 years of age. Her husband, Jacobo Trumper, has the hotmail.com address TrumperJacobo...if you write to him, you should do so in Español. March 2008, Inés Vitale (that is Ines with an accent on the e, in case your web browser shows weird stuff) and Susie McCoy Tollett checked in. Miles plans to visit Buenos Aires and Rosario in August-September 2008. Ines would like to have another get-together of Colegio folks. Is anyone else interested? August 2005, David Phillips checked in. After seeing Roland's photos, he writes: Actually, I may have a unique story to tell, as for 2 of my 3 years at the school, I took my classes in spanish. This was due to the fact that I was the only English language student enrolled at the time. On another note, WHAT DID THEY DO TO MY COURTYARD FUTBOL GROUND? We had small goals on either end, and played every chance we had. Best set was 6 a sides. Guess you can never really go back. lol. David's email address is daviator201 -at- yahoo -dot- com. November-December 2004, Roland Heddins did a "memory lane" visit to Rosario. See a link to his terrific photos above. June, 2000, Carole Anderson Crow's husband John passed away unexpectedly. August 21, 1999, "Scout historian" Peter Bielack was quoted in a Knight-Ridder newspaper article describing a Washington, D.C., statue that honors the Boy Scouts. August 6, 1999, Mark D'Alisera passed away in Houston after a three-year struggle with lung cancer. He was a long-time Rosario resident and Colegio student in the 1960's. Please send news items to Miles Abernathy, miles99 -AT- gmail.com. Also, if you a member of Classmates.org, would you tell me what discussions (if any) there involve Colegio? I am not a member, but they send me spam every week about Colegio.